Lufthansa Systems, a division of Lufthansa Airlines, is one of the world’s leading providers of IT services in the airline industry. It serves roughly 300 national and international airlines comprising more than one-third of all airlines worldwide. Among its many offerings, Lufthansa Systems offers Lido/FPLE (flight planning services), which determine the most effective flight routes in terms of cost, fuel and time. By optimizing flight routes, Lido/FPLS generates millions of dollars in extra profits for its customers each year. 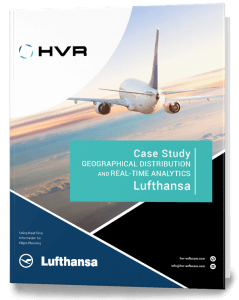 The data necessary for up-to-the-minute flight planning must be replicated to the central data repository at Lufthansa Systems. Optimized plans must be replicated back to the customer airlines. HVR replicates bi-directionally between the central source to hundreds of different target databases at customer sites all over the world – even over restricted network links. Some customers use HVR for HA and reporting.